Works with items 1880 or 1879 Paint-less Dent Repair Tool Set. Minor dent images are projected onto screen which enables repairer to locate the areas needed for repair. Allows you to locate tool tip as well as see the distortion of dent on the panel. Dent board with suction cup can be positioned at any angle. White board with black lines for medium to dark colour vehicles. Works with items 1880 or 1879 Paint-less Dent Repair Tool Set. Minor dent images are projected onto screen which enables repairer to locate the areas needed for repair. 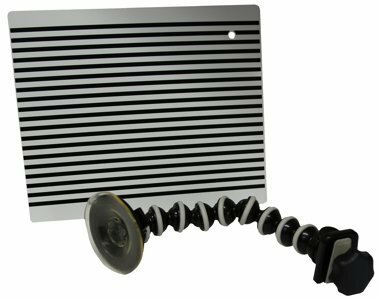 Dent board with suction cup can be positioned at any angle. White board with black lines for medium to dark colour vehicles.